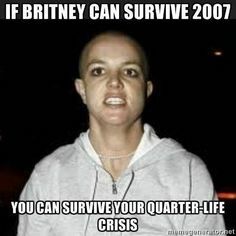 Quarter life crisis is a term I learned about while I was in college from my friends who had just entered the post grad world. You spend your whole life wondering what your future will be once you hit “adulthood” and you end up looking forward to it. When I was in college, I couldn’t wait to turn 21 so I could go to a casual bar and meet new people all the time because that’s just how I thought it worked. When I was a senior, I couldn’t wait to be graduated because I was tired of dealing with the stress of homework, classes, a job, all of my school involvement, etc. I thought that being an adult would be less stressful because you really only had to worry about your job. OH MAN WAS I WRONG. 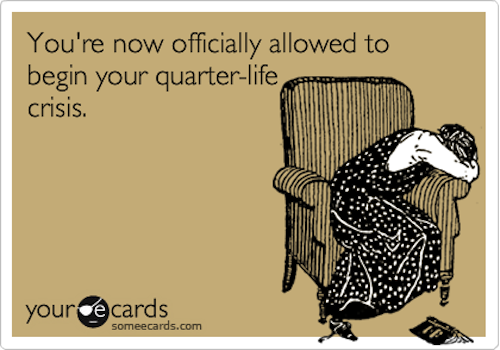 Hence the quarter life crisis. Basically at some point in your twenties, everyone will experience the whole “Whoa wait a sec, what the heck am I doing with my life?” question. Do you live in the right area? Do you like your job? How do I file my taxes? You mean my health insurance and car insurance won’t be covered by my parents anymore??? HUH? I’ll admit, I’ve been fairly stressed these past couple months between being the Bad Luck Club president, working two jobs and then being hit with both pink eye and shingles. 2015 hasn’t liked me too much so far. However, it’s all about keeping your head above the water. I have no doubt that at this point next year, I’ll feel like everything is smooth sailing- I won’t have to worry about changing insurances, I’ll know how to file my taxes, I’ll be working a job that I’m more content with, and hopefully will be more adjusted to living in a totally new city. I’ll look back and laugh at myself and just be glad that I made it through thanks to the help of my very patient friends and family who have listened to me gripe for the past couple months (and you guys too!). – Take a chill pill. Take a step back from an annoyingly stressful situation, take a deep breath and know that it’ll be over soon. You can’t afford to internalize the stress; it really does take a toll on your body by not sleeping or always feeling on edge. In my case, it caused pre-mature shingles SOOOOO I’ve been there. This is something I’m still working on too. – Find your people or person, and thank them endlessly. I honestly couldn’t be more grateful to my parents or my roommates because I’d probably be a puddle of tears unable to do anything without them. Whether your best friends are near or far, they’re there to support you and hear you out when you tell them the most ridiculous thing that happened to you even if they want to roll their eyes. That’s true love, right there. – Schedule time for you to do things for yourself. I’ve joined a gym and really pushed myself to go as often as I can. I use that hour or more to really only focus on that one thing, bettering myself FOR ME and forget about everything else that’s too stressful. Maybe your stress reliever is binge watching some Netflix. Hey man, I do that too. My current suggestion is the Unbreakable Kimmy Schmidt, produced by Tina Fey. Totally corny but worth the giggles! – Get organized. Maybe you’re also a Type A personality like me, and really enjoy making To-Do lists and calendars to help organize your life. Maybe you’re like my roommate who is “messy but loveable” who just throws her clothes all over the floor. Pick them up and straighten something that might make you feel the tiniest bit less overwhelmed. Making a plan has always worked for me because I end up feeling pretty horrible if I use one day being totally unproductive. – Make a good meal for yourself. I tend to feel like I’m too busy to make food for myself which is why I end up eating cereal and grilled cheese a lot (yay carbs!). But on that one day where I find that I have an extra hour, I’ll blast some Spotify or put on Netflix while I cook a meal that I can eat for a couple days. That way, on days where you feel extra lazy, you already have some sauteed veggies to eat and keep you from over carb loading and feeling extra heavy. Overall, I’m just saying BE NICE TO YOURSELF. It’s definitely something that I’m still struggling with and slowly learning in my post grad life. If you don’t take care of yourself, no one else will! Things are on the up and up, friends! Nicer weather is on it’s way too! THANK GOODNESS. I could use a little more vitamin D in my life. Check back on Food for Thought Thursday where I talk about secret kitchen lingo!